We have been doing lapidary for 40 years and hand cut most of our own items. 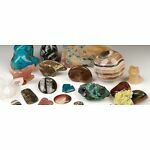 We carry rough rock, stone slabs, eggs, spheres, animal carvings, and more. U.S.A. dealer and, unless otherwise stated, you get the exact item pictured!